We are thrilled with the house and all you have done! The dining room chairs are perfect and our room is amazing! Better than we imagined! Kim loves her new bedroom too. The new set of photos are a wonderful reminder of great times. Last night we had a truly special time together as a family – you have transformed our home into the Gathering Place we had hoped to have. Thank you! Just got down here. Peter, once again you hit it out of the park!!! You’ve got a great imagination and you’re very good at what you do. Thank you for letting us benefit from it. Our Kitchen was small and totally dysfunctional. Pieces of cabinetry would literally come off in your hand and we had to keep a large portion of our cooking tools and serving dishes in an upstairs closet. Now, every time we walk into the kitchen we can’t help but smile – it suits us perfectly. We are elated to be able to cook together without running into each other/each other’s workspace. Now that the kitchen is open to the living room, the spaces compliment each other beautifully. We feel like the house is finally our space. The attention to details was incredible! The dedication to the job, unmatched. If you want things done right, done accurately, and with a personal sense of style – choose Peter E! We were most excited with the project results, because they were completed exactly as we asked. Of personal benefit, was the professional appearance and operation of the products. The best part of working with Peter E Designs was the outcome of the project and how professional the contractors were, including the cleaning that followed after the completion of the project. Everything was perfect the first time! We are very confident in recommending your services and the quality of the outcome of the project. I was unable to repurpose my home after the death of my husband to be more reflective of me and my needs. The open space design of the house was challenging and frankly, above my skill level. I needed professional help. The house was a depressing gray and stark white throughout. Peter worked with me and developed a color scheme reflecting the summer person I am, while breathing new life and light into the house. I was presented with options on furniture, art and accessories that suited my lifestyle, reflected my achievements, love of animals and nature. Most appreciated, was Peter’s flexibility; from slowing the pace of the project to minimize my stress level, to using hospital quality paint and natural materials to create a healthy living space and minimize allergens. I felt listened to and involved, so that the choices we made were inline with my goals. I am now a happy widow in a beautiful home, surrounded by the things I enjoy most. Working with Peter I enjoyed the feeling of being listened to, and the expertise offered. These two things are both important, and they’re hard to balance. He’s patient, intuitive, doesn’t take it personally if his suggestion doesn’t resonate, and communicates on different levels all at once – the emotional, the technical, the imaginative and the practical. Don’t let his calm demeanor fool you into thinking he’s not a total pro. He’s a skilled designer and an excellent communicator; he’s also really reliable. He’s not going to sell you on something you won’t be happy with, pretend that drama is the same as creative talent, or disappear once he’s got your business. He’s a lovely person to work with, and you’ll like his work. As the General Manager of The Light House of Lewes it has been my pleasure to work with Peter Edmond of Peter E Designs for many years. Peter has the creativity and ability to see a project completed before he even begins. With over 20 years of experience his vision is truly remarkable. He is very sensitive to his clients’ needs, wanting to ensure that their design journey is enjoyable resulting in complete satisfaction. Peter is also a great problem solver when challenging situations arise. He can come up with a solution quickly, often leaving the client unaware there ever was a problem. That is so refreshing in today’s design world. Peter asked pointed questions to get a feel of what we needed. He knew, we were working with a tight budget and were afraid that we could not get the quality and feel we wanted. The best part was being active participants as Peter presented viable choices to achieve our goals. Peter was patient, and advised us about quality of materials, maintenance, alternatives and cost. Some of the items were expensive and we thought we were over budget. Peter showed us where not to skimp and where to save. He assured us that we were within the limits of our finances. At completion, we were within budget and we got the bathroom of our dreams! We are glad we were open-minded, and trust the designer. At times we were skeptical, but the end results proved any reservations – unfounded. Paul and Diane Ellis, Philadelphia, PA.
My home feels alive! I am enjoying it as if it were new and the first time living here. I am happier and enjoy just being home. I see my art and treasures collected over the years, with new eyes. Before I was looking at the dark colors I had painted the walls and didn’t even know it. Peter E offered choices and discussed all changes that were made. I felt my opinions validated, my input desired and I didn’t feel pushed into things I didn’t want. But the changes and colors schemes were nothing I myself would have ever thought of doing or trying. During the process at times I wasn’t sure about how it was going to look, but once it was done, I loved it. It is me! Peter designs for each person as an individual. He will make your space reflect who you are, not who he is. He takes the time in getting to know who you are and how you desire each room to feel. When he is done you will have a home or office that is yours. As a Designer, Peter has a very organic sense of style and function. His designs are realistic and practical and address the way people really live. Very Cool! I have used the services of Peter with great satisfaction in the designing of my four bedroom house. I truly appreciate the latitude and input in the designing process. Peter excels in the three areas of most importance: Ability, Integrity, and Attention to Detail. A truly competent, extremely creative and the consummate professional. Peter turns dreams, hopes, wishes, half glimpsed aspirations into reality. If like me you aspire to be unique, and expressive, then Peter is the best person to work with in making your architectural aspirations and dreams a reality. I met Peter E in my workshop about fifteen years ago, as a young Interior Architect. Peter believes that the Furniture Industry in Jamaica should be design lead, which we all agree on. 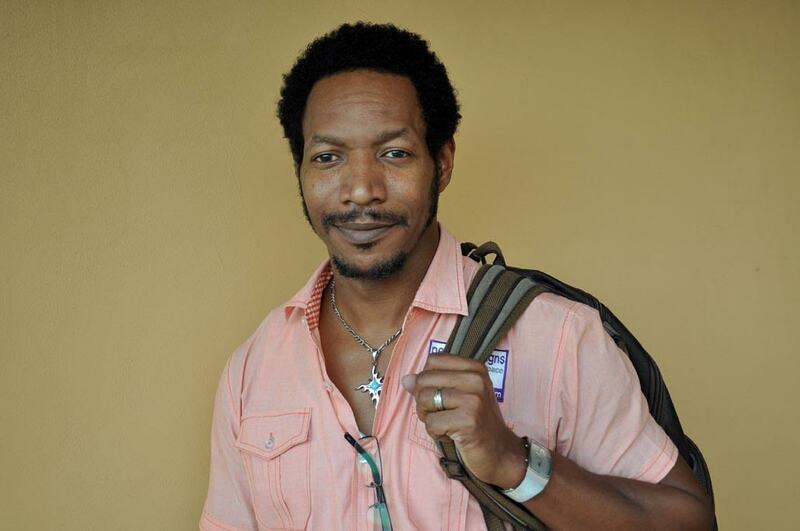 He is now representing JAWFA – (Jamaica Wood Products and Furniture Association) in the West. Technically, Peter with his creativity and present knowledge of the furniture industry, has produced very interesting items for his market. He has also done many a presentation for me on my jobs, doing the drawings to assist the manufacturer. I have found him very professional, talented and knowledgeable in the industry, and can, recommend him for the future. Myrna McGann (Betty) Interior Designer – Furniture Manufacturer – Design Centre Ltd – Designmobay- Past President JAWFA. Dear CEO, I wish to express my congratulations and satisfaction with the renovated NLA in Montego Bay. The building was long in coming but now offers excellent physical comfort to staff and customers and will inure to the benefit of Western Jamaica in the delivery of land titling. “Peter E has been my Designer for my home and businesses for over eight years. Peter is attune to my needs, challenges and ideas which he addresses in designs I am extremely happy with. I find his sense of color to be superior. He is also excellent in his use and appointment of space. Launa Alvaranga, Options Cosmetics Ltd.